Christmas controversy: Are iPads bad for kids? When my son was less than a year old, he began crying one afternoon and would not stop. He’d been fed; his diaper was clean. Try as I might, I couldn’t discern the source of his stress—nor could I get him to pipe down. So I took my brand new iPhone 3G, turned it on, and put it in his stroller with him. Complete silence ensued. It was glorious. It also might’ve been a moment of truly awful parenting. With Christmas on the way, and the iPad selling like proverbial hotcakes, controversy has sprung up over whether children should be giving the electronic tablets to their children as gifts. 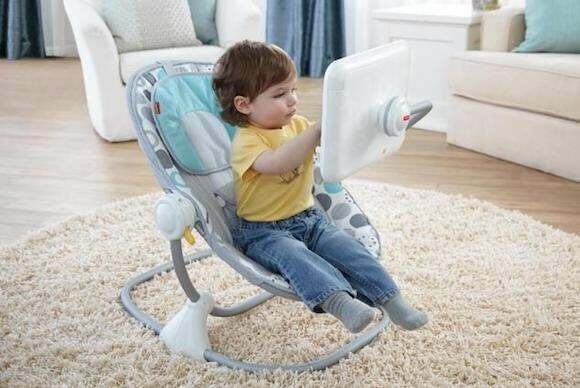 A focal point of the debate: Fisher-Price’s $80 Newborn-to-Toddler Apptivity Seat for iPad, which displays the iPad right in front of a very young (and mostly immobile) child. “Babies thrive when they’re talked to, played with, and held—not when they’re alone with a screen,” grumbled Dr. Susan Linn, director of the Campaign for a Commercial-Free Childhood, which has petitioned Fisher-Price to recall the product. The New York Times, meanwhile, piped up with “7 Reasons Not to Buy Your Child an iPad for Christmas.” The number one reason? “It’s no fun.” That seemed … counterintuitive. If it’s not fun, why do kids want to use them so badly? My son is now a healthy, bright 5-year-old kindergartener. But the controversy made me wonder: Had I ruined him? Had my desire for an occasional moment of peace in the house caused me to forsake his mental and social development? Caroline Knorr, parenting editor at Common Sense Media, told me not to sweat it. Yes, she said, the American Academy of Pediatrics recommends that children under 2 be given no access at all to screen time—exposure to TVs, phones, or tablets—and older children get only limited amounts of heavily supervised time with a screen. “Young kids need a variety of experiences to develop healthily,” she said. In other words, there’s probably not much harm done if a frazzled parent uses an iPhone or iPad to soothe a cranky toddler, all for the sake of getting 20 minutes to finally take a shower. Indeed, a recent study by Common Sense media suggests that 38 percent of children under the age of 2 have used a mobile device; that same study showed that 75 percent of all kids under the age of 8 have a mobile device of some sort in the home, up dramatically from 52 percent in 2011. The key, Knorr said, is the same as it is in most other endeavors involving your children: Be an engaged parent. Limit the time your kids spend in front of a screen, and when they are using the iPhone or iPad, guide them to apps and content that might helps them learn a few lessons and develop a few skills. “If you’re going to expose young kids to screens, including tablets and smart phones, make an effort to find quality and age-appropriate content, so you’re not just handing over a tablet or smartphone mindlessly,” Knorr said.